This is an inquiry based lesson where students work together to discover which equations are linear versus non-linear. 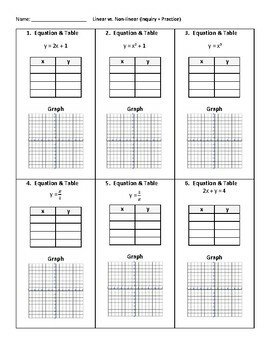 Students are given 6 equations where they graph and make a table. 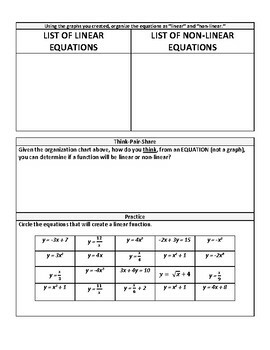 Afterwords, a list of linear and nonlinear equations are made, and a place to record their thoughts as well as their classmates thoughts is listed as well. After the concept is understood and stamped, students are able to practice identifying linear equations. I have used this as partner practice, group work, as well as "lesson preview" homework. Students were more likely to retain this concept as they "discovered" the rules with my faciiliation instead of my direct-instruction.